A native of Honolulu, Samuel King was the son of a sea captain, James A. King, who settled in Hawai`i in the 1860s and began an inter-island shipping business. James later served as minister of the interior under the Republic. Samuel's mother was Charlotte Homes Davis King, a part-Hawaiian descendent of O`ahu chiefs. After receiving his early education in Hawai`i, Samuel King attended the U.S. Naval Academy at Annapolis and entered active duty with the Navy after his graduation in 1910. King's Navy duty continued through 1924, including action during World War I. During the 1920s and '30s, King returned to Hawai`i where he worked in government and on various commissions. In 1934, he was elected as a territorial delegate to Congress and served there until 1942. In 1942, he returned to active military duty and served in the Navy through the years of World War II. 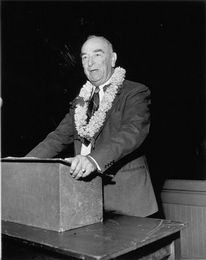 Beginning in 1947, King was an active member of the Hawai`i Statehood Commission. President Eisenhower appointed him governor for one term in 1953. Two years after retiring from the governorship, King died in Honolulu of a heart attack.